Gone are the days, when people used to go through a classified ads section in a newspaper to find the services they need. Classified websites are better alternatives today. On the other hand, they have become a better online business commercial center where people pitch their products and services to anyone interesting for the same. From mobiles to real estate to beauty products to jobs, different services and products can list on classified websites. 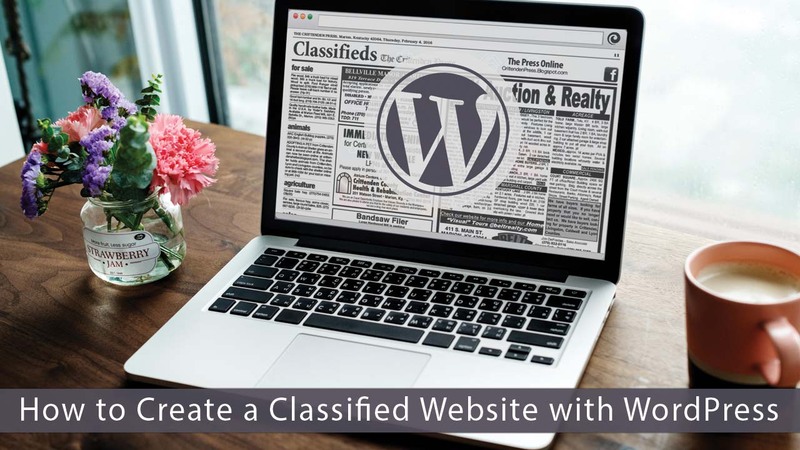 If you too want to create a classified website, here is a step-by-step guide for you. First of all, you should think of a domain for your website. Choose a domain name that best describes your brand. It should be short, memorable and easy to remember. Next, choose popular extensions such as “.com”. If your classified website will be limited to a certain country, you can go for a country-specific extension such as .au(Australia) .br (Brazil), .in (India), .uk (United Kingdom), etc. Once you’re done with choosing your domain name, it is time to register it. You can choose any of the popular domain name registrars such as Namecheap, GoDaddy, etc. Additionally, you can register your domain name with your web host. For any website, choosing a reliable web host is a crucial step. It is recommended that you choose the one that comes with multiple hosting plans, excellent uptime, and 24/7 support. Finding such a provider can be a time-taking process. To save your time, you should read reviews about different hosting providers. It is a better you search for a blog post comparing the top hosting providers of the industry. One such post is available here. It will help you know more about your potential hosting provider. Talking about the hosting plan, it is advisable that you choose a WordPress optimized plan. With an optimized plan, you get pre-installed WordPress, which is better optimized for security and speed. With most WP optimized plans, you get automatic backups as well. When it comes to the content management system, WordPress is the most preferred platform. Millions of websites across the globe are built with WordPress. According to WordPress, they are powering more than 33% of all sites across the web. Let’s take a look at some advantages of WordPress. -It can be downloaded and installed for free on your hosting account. -It is a user-friendly platform. You can easily figure out how to work with it. -It is highly customizable – thanks to its thousands of plugins and themes. You can add different functionalities and design to your website. -It is an SEO friendly. There are numerous plugins available that help you optimize your site according to search engines. If for any reason, you don’t want to use WordPress, you can go for self-hosted website builders as well. A website builder helps you launch a website in a few minutes. Now when you have chosen your domain name, hosting plan and website building platform, it is time to get into the details of how you want your website to look like in terms of design. In order to personalize your WordPress classified site, look for a theme that you can customize according to your needs. There are a number of premium themes available on ThemeForest that you can use to create a classified website. MyListing is a good theme which lets you create any type of directory without using any web code. The theme allows you to design your pages on the front end. Moreover, it is mobile-friendly, supports drag-and-drop front-end page builder. This theme has more than 50 ready-to-build elements for your site. WooCommerce integration is also supported by this theme. Other WordPress classified themes you can consider are Classiera theme, AdForest, ClassiPress, etc. You should choose a theme, which is flexible and gives you a lot of options to monetize your website. Also, don’t ignore designing part. Look for theme having a sleek design that can capture your visitors’ mind. To create a fully functional classified website, add some pages and menus to your website. It will give your site some structure. Your theme will already have numerous templates for important pages, so you just need to edit them according to your requirement. Simply add your data on these templates. Once all your pages are ready, link them with menus and submenus reflecting the different listings categories. According to your choice, you can create categories such as entertainment, personals, jobs, etc. Always keep your website well-organized so that users can search for different listing easily. Make sure your home page is linked to the page which allows users to submit their classified ads or create an account. Add high-quality images with your product listing. It will give your users a better idea of the products you want to sell. Along with pictures, add relevant product description and other important details such as price, the location of the product, contact details of sellers, etc. On the basis of your listing, you can add more information. Design all your “call to action” buttons carefully. They should be clearly visible and easily accessible. There is no benefit of creating a classified website if it is not monetized. Two of the best easiest ways to monetize a classified website is, through paid classifieds ad listings and advertisement banners. You can place advertisement banners anywhere on your site. It can be your home page or category page. With premium themes like AdForest or MyListing, you get a simple way to display banner ads on your site. In the beginning, you might have to reach out to advertisers yourself. However, once your site will start getting traffic, advertisers will be interested in advertising their products and services on your site. Second monetization method is, charge for classified submission. You can offer two different tiers for those who want to post their ads on your site. For example, you can have a free tier that comes with some standard features and a paid tier that has advanced features. It is not enough to create a classified website, you will also have to promote it and get a decent amount of traffic. One good way to promote your site is to use paid advertising via Google AdWords. It is a simple yet costly way to get more visitors to your website. If you don’t want to invest a huge amount in the promotion, invest some time and effort in promoting your website via social media platforms such as Facebook, Instagram, Twitter, Pinterest, etc or via search engine optimization. You can also create a YouTube channel and create some classified related videos to promote your website. Along with promotion also focus on maintenance of your website. That’s all you have to do to create a classified website and promote it successfully.